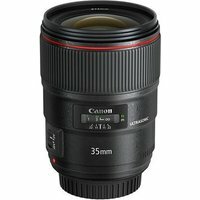 This is the Canon EF 35mm f1.4L II USM, a new wide angle L-series lens designed for professional photographers who want to capture the world with a natural perspective. Replacing the legendary EF 35mm f1.4L USM, this new lens is the first to feature Canon's newly developed Blue Spectrum Refractive optics. Together with Canon's high performance lens coatings, the EF 35mm f1.4L II USM delivers amazing results with improved contrast and minimal flare or ghosting.